In the previous part of this series, we looked at the basic structure of Azure Monitor alerts, and then specifically at metric alerts. In this part we will consider other types of alert that Azure Monitor can emit. We will first discuss application log alerts – sometimes simply called log alerts – which let us be notified about important data emitted into our application logs. Next we will discuss activity log alerts, which notify us when events happen within Azure itself. These include service health alerts, which Azure emits when there are issues with a service. Part 1 provides an introduction to the series by describing why we should instrument our systems, outlines some of the major tools that Azure provides such as Azure Monitor, and argues why we should be adopting an ‘infrastructure as code’ mindset for our instrumentation and monitoring components. Part 2 describes Azure Application Insights, including its proactive detection and alert features. It also outlines a pattern for deploying instrumentation components based on the requirements we might typically have for different environments, from short-lived development and test environments through to production. Part 3 discusses how to publish custom metrics, both through Application Insights and to Azure Monitor. Custom metrics let us enrich the data that is available to our instrumentation components. Part 4 covers the basics of alerts and metric alerts. Azure Monitor’s powerful alerting system is a big topic, and in this part we’ll discuss how it works overall, as well as how to get alerts for built-in and custom metrics. Part 5 (this post) covers log alerts and resource health alerts, two other major types of alerts that Azure Monitor provides. Log alerts let us alert on information coming into Application Insights logs and Log Analytics workspaces, while resource health alerts us when Azure itself is having an issue that may result in downtime or degraded performance. Part 6 (coming soon) describes dashboards. The Azure Portal has a great dashboard UI, and our instrumentation data can be made available as charts. Dashboards are also possible to automate, and I’ll show a few tips and tricks I’ve learned when doing this. Part 7 (coming soon) covers availability tests, which let us proactively monitor our web applications for potential outages. We’ll discuss deploying and automating both single-step (ping) and multi-step availability tests. Part 8 (coming soon) describes autoscale. While this isn’t exactly instrumentation in and of itself, autoscale is built on much of the same data used to drive alerts and dashboards, and autoscale rules can be automated as well. Finally, part 9 (coming soon) covers exporting data to other systems. Azure Monitor metrics and log data can be automatically exported, as can Application Insights data, and the export rules can be exported and used from automation scripts. Azure supports application-level logging into two main destinations: Application Insights (which we discussed in part 2 of this series) and Azure Monitor’s own log management system. Both of these services receive log entries, store and index them within a few minutes, and allow for interactive querying through a powerful syntax called KQL. Additionally, we can create scheduled log query alert rules that run on the log data. Note: Microsoft recently announced that they have renamed the service previously known as Log Analytics to Azure Monitor logs. This is a sensible change, in my opinion, since it reflects the fact that logs are just another piece of data within Azure Monitor. Scheduled log query alert rules are relatively simple: at a frequency that we specify, they run a defined query and then look at the result. If the result matches criteria that we have specified then an alert is fired. Like metric alert rules, scheduled log alert rules specify the conditions under which an alert should fire, but they don’t specify the process by which a human or system should be notified. Action groups, described in detail in part 4 of this series, fill that role. Important: Like metric alerts, log alerts cost money – and there is no free quota provided for log alerts currently. Be aware of this when you create test alert rules! Data source is a reference to the location that stores the logs, such as an Application Insights instance. This is similar to the scopes property in metric alerts. Note that in ARM templates for log alerts, we specify the data source twice – once as a tag, and once as a property of the alert rule resource. Also, note that we can perform cross-workspace queries (for example, joining data from Application Insights with data in Azure Monitor logs); when we do so, we need to specify the full list of data sources we’re querying in the authorizedResources property. Query is a KQL query that should be executed on a regular basis. Query type indicates how the results of the query should be interpreted. For example, if we want to count the number of results and compare it to a threshold, we would use the ResultCount query type. Trigger specifies the critical threshold for the query results. This includes both a threshold value and a comparison operator. Schedule specifies how frequently the log query should run, and the time window that the log query should consider. Note that more frequent executions result in a higher cost. Severity is the importance of the alert rule, which (as described in part 4 of this series) may be helpful information to whomever is responding to an alert from this rule so that they can understand its importance. Actions are the action groups that should be invoked when an alert is fired. Metadata includes a name and description of the alert rule. Full documentation is available within the ARM API documentation site. There are some idiosyncrasies with these ARM templates, including the use of a mandatory tag and the fact that the enabledproperty is a string rather than a boolean value, so I suggest copying a known working example and modifying it incrementally. Data source was the Application Insights instance for the application. Query type was ResultCount, since we were interested in monitoring the number of log entries matching the query. Trigger was set to greater than and 0 for the operator and threshold, respectively. Schedule was set to evaluate the query every five minutes, and to look back at the last five minutes, which meant that we have round-the-clock monitoring on this rule. Severity was 3, since we considered this to be a warning-level event but not an immediate emergency. Action was set to an action group that sent an email to the development team. Note that this ARM template also creates an action group with an email action, but of course you can have whatever action groups you want; you can also refer to shared action groups in other resource groups. Of course, if you have data within Azure Monitor logs (previously Log Analytics workspaces) then the same process applies there, but with a different data source. There is also a special scenario available: when certain log data gets ingested into Azure Monitor logs workspaces, it is made available for metric alerting. These alerts are for data including performance counters from virtual machines and certain other types of well-known log data. In these cases, logs are used to transmit the data but it is fundamentally a metric, so this feature of Azure Monitor exposes it as such. More information on this feature, including an example ARM template, is available here. Azure’s activity log is populated by Azure automatically. It includes a number of different types of data, including resource-level operations (e.g. resource creation, modification, and deletion), service health data (e.g. when a maintenance event is planned for a virtual machine), and a variety of other types of log data that can be specific to individual resource types. More detail about the data captured by the activity log is available on the Azure documentation pages. Scope is the resource that we want to monitor the activity log entries from, and alert on. Note that we can provide a resource group or even a subscription reference here, and all of the resources within those scopes will be covered. Condition is the set of specific rules that should be evaluated. These are a set of boolean rules to evaluate log entries’ categories, resource types, and other key properties. Importantly, you must always provide a category filter. Actions are references to the action group (or groups) that should be invoked when an alert is fired. Unlike application log queries, we don’t specify a KQL query or a time window; we instead have a simpler set of boolean criteria to use to filter events and get alerts. Note that activity log alert resources should be created in the global location. More information on activity log alerts is available here; more detail on the ARM template syntax and other ways of automating their creation is available here; and even more detail on the ARM resource properties is available here. Azure provides service health events to advise of expected as well as unexpected issues with Azure services. For example, when virtual machines have a maintenance window scheduled, Azure publishes a service health event to notify you of this fact. Similarly, if Azure had a problem with a particular service (e.g. Azure Storage), it would typically publish a service health event to advise of the incident details, often both during the incident and after the incident has been resolved. Service health events are published into the activity log. A great deal of information is available about these events, and as a result, activity log alert rules can be used to monitor for service health events as well. Simply use the ServiceHealth category, and then the properties available on service health events, to filter them as appropriate. An example ARM template is available within the Microsoft documentation for service health alerts. Azure also helps to filter the relevant service health events into another category of activity log event, using the ResourceHealth category. While service health events provide information about planned maintenance and incidents that may affect entire Azure services, resource health events are specific to your particular resource. They essentially filter and collapse service health events into a single health status for a given resource. Once again, Microsoft provide an example ARM template within their documentation. In this post we have discussed the different types of log alerts that Azure Monitor provides. Scheduled log query alert rules let us define queries that we should run on the structured, semi-structured, or unstructured logs that our applications emit, and then have these queries run automatically and alert us when their results show particular signals that we need to pay attention to. Activity log alert rules let us monitor data that is emitted by Azure itself, including by Azure Resource Manager and by Azure’s service health monitoring systems. We have now discussed the key components of Azure Monitor’s alerting system. The alerting system works across four main resource types: action groups, and then the different types of alert rules (metric, scheduled log query, and activity log). By using all of these components together, we can create robust monitoring solutions that make use of data emitted by Azure automatically, and by custom log data and metrics that we report into Azure Monitor ourselves. In the next post of this series we will discuss another important aspect of interacting with data that has been sent into Azure Monitor: viewing and manipulating data using dashboards. One of the most important features of Azure Monitor is its ability to send alerts when something interesting happens – in other words, when our telemetry meets some criteria we have told Azure Monitor that we’re interested in. We might have alerts that indicate when our application is down, or when it’s getting an unusually high amount of traffic, or when the response time or other performance metrics aren’t within the normal range. We can also have alerts based on the contents of log messages, and on the health status of Azure resources as reported by Azure itself. In this post, we’ll look at how alerts work within Azure Monitor and will see how these can be automated using ARM templates. This post will focus on the general workings of the alerts system, including action groups, and on metric alerts; part 5 (coming soon) will look at log alerts and resource health alerts. Part 4 (this post) covers the basics of alerts and metric alerts. Azure Monitor’s powerful alerting system is a big topic, and in this part we’ll discuss how it works overall, as well as how to get alerts for built-in and custom metrics. Part 5 (coming soon) covers log alerts and resource health alerts, two other major types of alerts that Azure Monitor provides. Log alerts let us alert on information coming into Application Insights logs and Log Analytics workspaces, while resource health alerts us when Azure itself is having an issue that may result in downtime or degraded performance. Alerts are described in detail on the Azure Monitor documentation, and I won’t re-hash the entire page here. Here is a quick summary, though. An alert rule defines the situations under which an alert should fire. For example, an alert rule might be something like when the average CPU utilisation goes above 80% over the last hour, or when the number of requests that get responses with an HTTP 5xx error code goes above 3 in the last 15 minutes. An alert is a single instance in which the alert rule fired. We tell Azure Monitor what alert rules we want to create, and Azure Monitor creates alerts and sends them out. Target resource: the Azure resource that should be monitored for this alert. For example, this might be an app service, a Cosmos DB account, or an Application Insights instance. Rule: the rule that should be applied when determining whether to fire an alert for the resource. For example, this might be a rule like when average CPU usage is greater than 50% within the last 5 minutes, or when a log message is written with a level of Warning. Rules include a number of sub-properties, and often include a time window or schedule that should be used to evaluate the alert rule. Action: the actions that should be performed when the alert has fired. For example, this might be email admin@example.com or invoke a webhook at https://example.com/alert. Azure Monitor provides a number of action types that can be invoked, which we’ll discuss below. There are also other pieces of metadata that we can set when we create alert rules, including the alert rule name, description, and severity. Severity is a useful piece of metadata that will be propagated to any alerts that fire from this alert rule, and allows for whoever is responding to understand how important the alert is likely to be, and to prioritise their list of alerts so that they deal with the most important alerts first. Azure Monitor currently has two types of alerts. Classic alerts are the original alert type supported by Azure Monitor since its inception, and can be contrasted with the newer alerts – which, confusingly, don’t seem to have a name, but which I’ll refer to as newer alerts for the sake of this post. There are many differences between classic and newer alerts. One such difference is that in classic alerts, actions and rules are mixed into a single ‘alert’ resource, while in newer alerts, actions and rules are separate resources (as described below in more detail). A second difference is that as Azure migrates from classic to newer alerts, some Azure resource types only support classic alerts, although these are all being migrated across to newer alerts. Microsoft recently announced that classic alerts will be retired in June 2019, so I won’t spend a lot of time discussing them here, although if you need to create a classic alert with an ARM template before June 2019, you can use this documentation page as a reference. All of the rest of this discussion will focus on newer alerts. A key component of Azure Monitor’s alert system is action groups, which define how an alert should be handled. Importantly, action groups are independent of the alert rule that triggered them. An alert rule defines when and why an alert should be fired, while an action group defines how the alert should be sent out to interested parties. For example, an action group can send an email to a specified email address, send an SMS notification, invoke a webhook, trigger a Logic App, or perform a number of other actions. A single action group can perform one or several of these actions. CreateEnterpriseIssue Shared-OpsTeam Invoke a webhook to create issue in enterprise issue tracking system. This might be used for high priority issues that need immediate, 24×7 attention. It will notify your organisation’s central operations team. SendSmsToTeamLead MyApplication Send an SMS to the development team lead. This might be used for high priority issues that also need 24×7 attention. It will notify the dev team lead. EmailDevelopmentTeam MyApplication Send an email to the development team’s shared email alias. This might be used to ensure the development team is aware of all production issues, including lower-priority issues that only need attention during business hours. Of course, these are just examples; you can set up any action groups that make sense for your application, team, or company. Action groups can be created and updated using ARM templates, using the Microsoft.Insights/actionGroups resource type. The schema is fairly straightforward, but one point to consider is the groupShortName property. The short name is used in several places throughout Azure Monitor, but importantly it is used to identify the action group on email and SMS message alerts that Azure Monitor sends. If you have multiple teams, multiple applications, or even just multiple alert groups, it’s important to choose a meaningful short name that will make sense to someone reading the alert. I find it helpful to put myself in the mind of the person (likely me!) who will be woken at 3am to a terse SMS informing them that something has happened; they will be half asleep while trying to make sense of the alert that they have received. Choosing an appropriate action group short name may help save them several minutes of troubleshooting time, reducing the time to diagnosis (and the time before they can return to bed). Unfortunately these short names must be 12 characters or fewer, so it’s not always easy to find a good name to use. Note that this will create all three action groups in the same resource group, rather than using separate resource groups for the shared and application-specific action groups. Once the action groups have been created, any SMS and email recipients will receive a confirmation message to let them know they are now in the action group. They can also unsubscribe from the action group if they choose. If you use a group email alias, it’s important to remember that if one recipient unsubscribes then the whole email address action will be disabled for that alert, and nobody on the email distribution list will get those alerts anymore. Now that we know how to create action groups that are ready to receive alerts and route them to the relevant people and places, let’s look at how we create an alert based on the metrics that Azure Monitor has recorded for our system. Important: Metric alerts are not free of charge, although there is a small free quota you get. Make sure you remove any test alert rules once you’re done, and take a look at the pricing information for more detail. Scope is the resource that has the metrics that we want to monitor and alert on. Evaluation frequency is how often Azure Monitor should check the resource to see if it meets the criteria. This is specified as an ISO 8601 period – for example, PT5M means check this alert every 5 minutes. Window size is how far back in time Azure Monitor should look when it checks the criteria. This is also specified as an ISO 8601 period – for example, PT1H means when running this alert, look at the metric history for the last 1 hour. This can be between 5 minutes and 24 hours. Criteria are the specific rules that should be evaluated. There is a sophisticated set of functionality available when specifying criteria, but commonly this will be something like (for an App Service) look at the number of requests that resulted in a 5xx status code response, and alert me if the count is greater than 3 or (for a Cosmos DB database) look at the number of requests where the StatusCode dimension was set to the value 429 (representing a throttled request), and alert me if the count is greater than 1. Each of these properties can be set within an ARM template using the resource type Microsoft.Insights/metricAlerts. Let’s discuss a few of these in more detail. Built-in metrics, which are published by Azure itself. Custom resource metrics, which are published by our applications and are attached to Azure resources. Application Insights allows for custom metrics that are also published by our applications, but are maintained within Application Insights rather than tied to a specific Azure resource. All three of these metric types can have alerts triggered from them. In the case of built-in and custom resource metrics, we will use the Azure resource itself as the scope of the metric alert. For Application Insights, we use the Application Insights resource (i.e. the resource of type Microsoft.Insights/components) as the scope. Note that Microsoft has recently announced a preview capability of monitoring multiple resources in a single metric alert rule. This currently only works with virtual machines, and as it’s such a narrow use case, I won’t discuss it here. However, keep in mind that the scopes property is specified as an array because of this feature. Name: a criterion can have a friendly name specified to help understand what caused an alert to fire. Metric name and namespace: the name of the metric that was published, and if it’s a custom metric, the namespace. For more information on metric namespaces see part 3 of this series. A list of built-in metrics published by Azure services is available here. Dimensions: if the metric has dimensions associated with it, we can filter the metrics to only consider certain dimension values. Dimension values can be included or excluded. Time aggregation: the way in which the metric should be aggregated – e.g. counted, summed, or have the maximum/minimum values considered. Operator: the comparison operator (e.g. greater than, less than) that should be used when comparing the aggregated metric value to the threshold. Threshold: the critical value at which the aggregated metric should trigger the alert to fire. These properties can be quite abstract, so let’s consider a couple of examples. Dimension would be set to filter the StatusCode dimension to only include the value 429, since 429 represents a throttled request. Operator would be GreaterThan, since we are interested in knowing when we see more than a single throttled request. Threshold would be 1, since we want to know whether we received more than one throttled request. Time aggregation would be Maximum. The TotalRequests metric is a count-based metric (i.e. each metric raw value represents the total number of requests for a given period of time), and so we want to look at the maximum value of the metric within the time window that we are considering. Metric name would be Http5xx, since that is the name of the metric published by App Services. Once again, there is no namespace. Operator would again be GreaterThan. Time aggregation would again be Maximum. Note that a single metric alert can have one or more criteria. The odata.type property of the criteria property can be set to different values depending on whether we have a single criterion (in which case use Microsoft.Azure.Monitor.SingleResourceMultipleMetricCriteria) or multiple (Microsoft.Azure.Monitor.MultipleResourceMultipleMetricCriteria). At the time of writing, if we use multiple criteria then all of the criteria must be met for the alert rule to fire. Azure Monitor recently added a new preview feature called dynamic thresholds. When we use dynamic thresholds then rather than specifying the metric thresholds ourselves, we instead let Azure Monitor watch the metric and learn its normal values, and then alert us if it notices a change. The feature is currently in preview, so I won’t discuss it in a lot of detail here, but there are example ARM templates available if you want to explore this. Let’s look at a couple of ARM templates to create the metric alert rules we discussed above. Each template also creates an action group with an email action, but of course you can have whatever action groups you want; you can also refer to shared action groups in other resource groups. Note: when I tried to execute the second ARM template, I sometimes found it would fail the first time around, but re-executing it worked. This seems to just be one of those weird things with ARM templates, unfortunately. Azure’s built-in metrics provide a huge amount of visibility into the operation of our system components, and of course we can enrich these with our own custom metrics (see part 3 of this series). Once the data is available to Azure Monitor, Azure Monitor can alert us based on whatever criteria we want to establish. The definitions of these metric alert rules is highly automatable using ARM templates, as is the definition of action groups to specify what should happen when an alert is fired. In the next part of this series we will look at alerts based on log data. One of the core data types that Azure Monitor works with is metrics – numerical pieces of data that represent the state of an Azure resource or of an application component at a specific point in time. Azure publishes built-in metrics for almost all Azure services, and these metrics are available for querying interactively as well as for use within alerts and other systems. In addition to the Azure-published metrics, we can also publish our own custom metrics. In this post we’ll discuss how to do this using both Azure Monitor’s recently announced support for custom metrics, and with Application Insights’ custom metrics features. We’ll start by looking at what metrics are and how they work. Part 3 (this post) discusses how to publish custom metrics, both through Application Insights and to Azure Monitor. Custom metrics let us enrich the data that is available to our instrumentation components. Metrics can be captured either in their raw or aggregated form. An aggregated metric is a way of simplifying the metric across a given period of time. For example, consider a system that processes messages from a queue. We could count the number of messages processed by the system in two ways: we could adjust our count every time a message is processed, or we could check the number of messages on the queue every minute, and batch these into five-minute blocks. The latter is one example of an aggregated metric. Because metrics are numerical in nature, they can be visualised in different ways. For example, a line chart might show the value of a metric over time. Azure Monitor also supports adding dimensions to metrics. Dimensions are extra pieces of data that help to add context to a metric. For example, the Azure Monitor metric for the number of messages in a Service Bus namespace has the entity (queue or topic) name as a dimension. Queries and visualisations against this metric can then filter down to specific topics, can visualise each topic separately, or can roll up all topics/queues and show the total number of messages across the whole Service Bus namespace. Azure Monitor currently has two metric systems. Classic metrics were traditionally published by most Azure services. When we use the Azure Portal, the Metrics (Classic) page displays these metrics. Near real-time metrics are the newer type of metrics, and Azure is moving to use this across all services. As their name suggests, these metrics get updated more frequently than classic metrics – where classic metrics might not appear for several minutes, near real-time metrics typically are available for querying within 1-2 minutes of being published, and sometimes much quicker than that. Additionally, near real-time metrics are the only metric type that supports dimensions; classic metrics do not. Custom metrics need to be published as near real-time metrics. Over time, all Azure services will move to the near real-time metrics system. In the meantime, you can check whether a given Azure service is publishing to the classic or newer metric system by checking this page. In this post we’ll only be dealing with the newer (near real-time) metric system. Almost all Azure services publish their own metrics in some form, although the usefulness and quality varies depending on the specific service. Core Azure services tend to have excellent support for metrics. Publishing of built-in metrics happens automatically and without any interaction on our part. The metrics are available for interactive querying through the portal and API, and for alerts and all of the other purposes we discussed in part 1 of this series. There are some situations where the built-in metrics aren’t enough for our purposes. This commonly happens within our own applications. For example, if our application has components that process messages from a queue then it can be helpful to know how many messages are being processed per minute, how long each message takes to process, and how many messages are currently on the queues. These metrics can help us to understand the health of our system, to provision new workers to help to process messages more quickly, or to understand bottlenecks that our developers might need to investigate. There are two ways that we can publish custom metrics into Azure Monitor. Azure Monitor custom metrics, currently a preview service, provides an API for us to send metrics into Azure Monitor. We submit our metrics to an Azure resource, and the metrics are saved alongside the built-in metrics for that resource. Application Insights also provides custom metrics. Our applications can create and publish metrics into Application Insights, and they are accessible by using Application Insights’ UI, and through the other places that we work with metrics. Although the core offering of publishing custom metrics into Application Insights is generally available, some specific features are in preview. How do we choose which approach to use? Broadly speaking I’d generally suggest using Azure Monitor’s custom metrics API for publishing resource or infrastructure-level metrics – i.e. enriching the data that Azure itself publishes about a resource – and I’d suggest using Application Insights for publishing application-level metrics – i.e. metrics about our own application code. Here’s a concrete example, again related to queue processing. If we have an application that processes queue messages, we’ll typically want instrumentation to understand how these queues and processors are behaving. If we’re using Service Bus queues or topics then we get a lot of instrumentation about our queues, including the number of messages that are currently on the queue. But if we’re using Azure Storage queues, we’re out of luck. Azure Storage queues don’t have the same metrics, and we don’t get the queue lengths from within Azure Monitor. This is an ideal use case for Azure Monitor’s custom metrics. We may also want to understand how long it’s taking us to process each message – from the time it was submitted to the queue to the time it completed processing. This is often an important metric to ensure that our data is up-to-date and that users are having the best experience possible. Ultimately this comes down to how long our application is taking to perform its logic, and so this is an application-level concern and not an infrastructure-level concern. We’ll use Application Insights for this custom metric. Let’s look at how we can write code to publish each of these metrics. Decide whether we will add dimensions. Decide whether we will aggregate our metric’s value. Authenticate and obtain an access token. 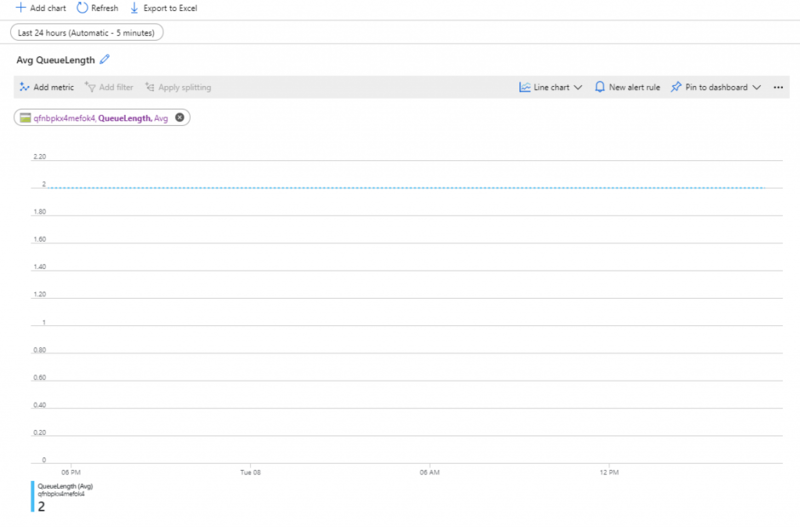 Send the metric data to the Azure Monitor metrics API. Let’s look at each of these in turn, in the context of an example Azure Function app that we’ll use to send our custom metrics. As described above, dimensions let us add extra data to our metrics so that we can group and compare them. We can submit metrics to Azure Monitor with or without dimensions. If we want to include dimensions, we need to include two extra properties – dimNames specifies the names of the dimensions we want to add to the metric, and dimValues specifies the values of those dimensions. The order of the dimension names and values must match so that Azure Monitor can relate the value to its dimension name. To save cost. Azure Monitor custom metrics aren’t cheap when you use them at scale, and so pre-aggregating within our application means we don’t need to incur quite as high a cost since we aren’t sending as much raw data to Azure Monitor to ingest. To reduce a very high volume of metrics. If we have a large number of metrics to report on, it will likely be much faster for us to send the aggregated metric to Azure Monitor rather than sending each individual metric. However, it’s up to us – we can choose to send individual values if we want. Azure Monitor would then be able to display the aggregated metrics for us when we query. The second part of this process is authorising the function’s identity to write metrics to resources. This is done by using the standard Azure role-based access control system. The function’s identity needs to be granted the Monitoring Metrics Publisher role, which has been defined with the well-known role definition ID 3913510d-42f4-4e42-8a64-420c390055eb. Currently Azure Monitor only supports a subset of Azure regions for custom metrics, but this list is likely to grow as the feature moves out of preview. Make sure to deploy this into a region that supports custom metrics, like West US 2. Once you’ve deployed it, you can create some queues in the storage account (use the storage account that begins with q and not the one that begins with fn). Add some messages to the queues, and then run the function or wait for it to run automatically every five minutes. As of the time of writing (January 2019), there is a bug where Azure Storage custom metrics don’t display dimensions. This will hopefully be fixed soon. Application Insights also allows for the publishing of custom metrics using its own SDK and APIs. These metrics can be queried through Azure Monitor in the same way as resource-level metrics. The process by which metrics are published into Application Insights is quite different to how Azure Monitor custom metrics are published, though. The Microsoft documentation on Application Insights custom metrics is quite comprehensive, so rather than restate it here I will simply link to the important parts. I will focus on the C# SDK in this post. To publish a custom metric to Application Insights you need an instance of the TelemetryClient class. In an Azure Functions app you can set the APPINSIGHTS_INSTRUMENTATIONKEY application setting – for example, within an ARM template – and then create an instance of TelemetryClient. The TelemetryClient will find the setting and will automatically configure itself to send telemetry to the correct place. Once you have an instance of TelemetryClient, you can use the GetMetric().TrackValue() method to log a new metric value, which is then pre-aggregated and sent to Application Insights after a short delay. Dimensions can also be set using the same method. There are a number of overloads of this method that can be used to submit custom dimensions, too. Note that as some features are in preview, they don’t work consistently yet – for example, at time of writing custom namespaces aren’t honoured correctly, but this should hopefully be resolved soon. If you want to send raw metrics rather than pre-aggregated metrics, the legacy TrackMetric() method can be used, but Microsoft discourage its use and are deprecating it. Custom metrics allow us to enrich our telemetry data with numerical values that can be aggregated and analysed, both manually through portal dashboards and APIs, and automatically using a variety of Azure Monitor features. We can publish custom metrics against any Azure resource by using the new custom metrics APIs, and we can also write application-level metrics to Application Insights. In the next part of this series we will start to look at alerts, and will specifically look at metric alerts – one way to have Azure Monitor process the data for both built-in and custom metrics and alert us when things go awry.